A multi-material 3D printer that can print in a wide range of colours has been unveiled in San Diego. The printer was unveiled by Stratasys at the SolidWorks World trade show. The company is behind the Makerbot range of 3D printers. According to the company, the new 3D printer makes use of triple-jetting technology. It combines droplets of three different base materials to reduce the need for separate print runs and painting. It works in the same way that a colour inkjet printer works, combining colours. 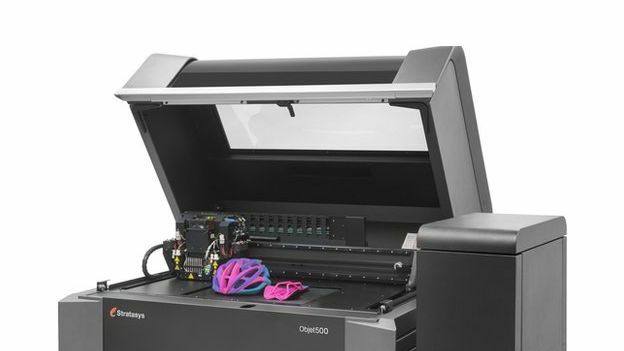 The company has said that the Objet500 Connex3 Color will prove be a “significant time-saver” for users of 3D printers, such as manufacturers and designers. Stratasys has said the 3D printer will be priced at $330,000 (around £200,000). The base materials for all of the products that can be produced through the printer are rubber and plastic. But multiple colours can be used of each material to produce a range of different products. The company used the example of cycle helmets as a product it can produce with the printer. Stratasys's marketing manager, Bruce Bradshaw told the BBC: “This will help industrial designers reduce the time it takes to bring prototypes to market by 50 per cent”. The printer isn't the first multi-material device to be launched, but it does have support for a much wider range of colours.